After we returned from our trip to South Africa I have been on the hunt to try as many Chin Blanc I can find. The styles vary by the different parts of the world. For example, the style of Chenin in Franc is more of a crispy non-barrel aged style. South Africa tends to be fermented in oak. In 1999, DNA analysis has shown that Chenin blanc has a parent-offspring relationship with the Jura wine grape Savagnin. 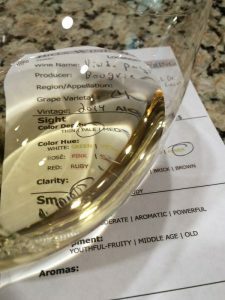 Additional DNA evidence shows that Chenin blanc shares a sibling relationship with Trousseau and Sauvignon blanc (both grapes the likely offspring of Savagnin) which strongly suggest that it is Chenin blanc that is the offspring and Savagnin are the parent variety. Through Chenin’s half-sibling relationship with Sauvignon blanc, the grape is related to an aunt/uncle variety to the Bordeaux wine grape Cabernet Sauvignon which is the offspring of Sauvignon blanc and Cabernet Franc. Chenin’s high acidity means it can be used to make everything from sparkling wines to well-balanced dessert wines, although it can produce very bland, neutral wines if the vine’s natural vigor is not controlled. Chenin Blanc also known as Steen was the first grape varietal planted in South Africa back in 1655. Moderate young-fruity aromas of melon, apple, and notes of honey. Dry, medium-bodied. Crisp refreshing with side-palate acidity. 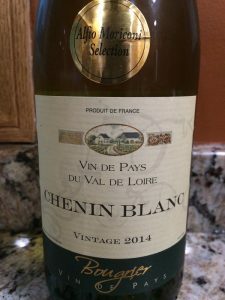 I rated the 2014 Famille Bougrier Chenin Blanc, IGP Val de Loire, France three glasses. It is a pretty darn good bottle of wine.